Set in the south of France on the River Ceze, this four-day event is a marathon of pleasure to the ears. Into its twenty-third year the festival attracts big name roots, rub-a-dub, rocksteady and ska artists to its main stage as well as some of the largest and most respected names in sound system culture to the neigh on perfect seven stack Dub Station. Seeing the original I-Threes and especially Rita in the flesh, who is the queen of Reggae in many eyes is a historical sight no doubt, but I quickly became drawn back to the sound system to see King Alpha and the upcoming French duo of OBF sound and Shanti-D taking the superior sound over the historical spectacles of Bob Andy, Derrick Morgan and the Gaylads. With temperatures in the mid 30s, Ernest Raglan backed by Sly and Robbie kicked off procedures with a guest appearance by the original Lone Ranger. This was followed by Rita Marley, Marcia Griffiths and Pam Hall on the main stage, at the same time that Dubkasm featuring Solo Banton were ripping it up on the sound system. Day two opened with 22-year old popular MC Biga Ranx’s set on the main stage. The hype and the crowd was huge, the opening tune ‘Gypsy Rock’ on a hip hop riddim with poppy shallow lyrics disappointed and I was eager to check out Spain’s Roberto Sanchez on the dub station. 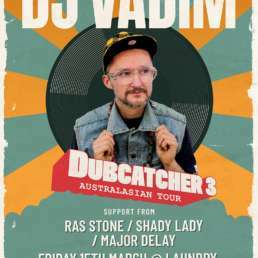 However I am pleased I hung around to see what followed as he immediately amped up the set with back-to-back Maffi riddims and several tunes showcasing his impressive fast chat style. Running over time and with the presenter Lone Ranger and stage crew eager to get the next act on, Biga Ranx begun a deadly ten minute acapella which sent the crowd and the stage crew into a frenzy, eventually being chased off stage with the mic still in his hand in hilarious bad boy fashion. Soon after it was announced that the King Jammy had taken ill and been hospitalised on his arrival to Marseille and therefore his sound clash with the Mad Professor was to be cancelled. This along with Sizzla’s cancelling brought some immediate somberness to the crowd which didn’t seem roused by the replacement artist, Sicilian Alborsie. A chance to see King Jammy live is a once in a life time opportunity and naturally I was disappointed by this. However there was a slow rise in mood brought on by an impressive vocal performance by Chezidek, a serious dub session by the Mad Prof and a bizarre entertaining show by Leroy Smart whom I dub the ‘James Brown of Reggae’ based on his on stage antics, taking us past midnight and to the final act of the night. A healthy sixty four year old Johnny Osborne then delivered a faultless down to business vocal performance which opened with a melody of ‘Rock it Tonight’ and ‘Murderer’ on the Heavenless riddim, his voice never faltering over the twelve or more tracks of no nonsense performing. ‘Ice Cream Love’ and ‘Fally Ranking’ were bang on, his ninety minute show can only be described as a cool and deadly performance. The Garance Reggae Festival is the kind of festival frequented by various Reggae aficionados, Iration Steppas’ Mark Iration, legendary producer Bunny Lee, Rae Cheddie of Wackies, former Studio One toaster Jim Nastics, Jerome Mungo, NZ producer Naram and the fifteen year old Junior Roy. I had the pleasure to attend a two hour Q&A with Bunny Lee as part of the ‘Off’ time of the festival. Lee spoke of his years as a producer and link man in the Jamaican scene of the 60s and 70s. He shared various stories of working with Coxsone, King Tubby, and Jammy and fondly recalled his dear friend Slim Smith. He also used the festival as the platform to plug his new book ‘Reggae Going international’ which he also abruptly managed to get mentioned during the sound clash later in the night. That night Diana Rutherford opened on the main stage followed by Freddy McGregor, The Mighty Diamonds, Beres Hammond, The Abbysinians and Alpha Blondy. I saw a solid Freddy McGregor set but the highly anticipated Mighty Diamonds, whose smooth and melodic vocal trio impressed, were let down by a lackluster backing band and sound man which looked and performed more like something from Coachella than Channel One. ‘Pass the Dutchie’ was the crowd favorite but again the sound quality often let the mind wander back to the Dub Station where Downbeat the Ruler (effectively Studio One’s Sound System) clashed with a much younger but heavy sound of Soul Stereo out of Paris. 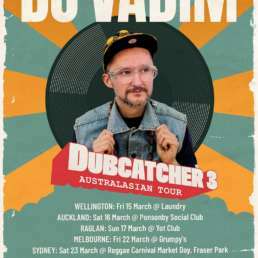 The amount of quality dubplates played was astonishing, three explosive rounds, an hour a piece, finished with an additional ninety minute dub fi dub in what must be a very historical night in sound clash history. 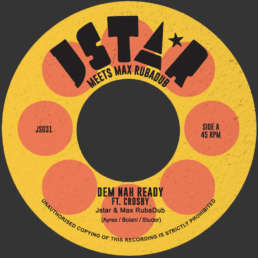 Old Jamaica vs New Europe, Downbeat the Ruler playing exclusive Studio One dubplates and Soul Stereo responding with equally rare responses. At one stage, with the crowd in a delirious state and the sound system surrounded by various names in reggae, hypeman Tony Screw dropped a Bunny Lee-produced dubplate, which saw the rotund producer run towards him in excitement and trip going tumbling across the back of the stage towards the stack only to be caught by Mark Iration. A conscious crowd recognised not only the brilliance of the session but also mediator Mark Iration’s view that Reggae music was the winner of the night of this deadly clash. After day three’s effect from the Dub Station it was obvious where the evening would be spent and apart from a fleeting hour visit to watch a lively Cocoa Tea performance, I was again fortunate to see a rare three hour set of Rootsting featuring Murryman, who, in his extraordinary repertoire delivered vocals in deep roots and a smooth Waterhouse fashion. The generous gift of the mic to young Junior Roy proved rewarding as the crowd sensing more history responded heavily to his sweet fifteen year old voice in a Billy Boyo stylee. Fittingly the festival concluded on the main stage with the popular Alborosie filling in for Sizzla, but I was still over at the packed dance seeing the much awaited Aba Shanti-I finish off for us with a three hour religious message and session. This also included a plethora of Studio One tunes which seem to be on a strong revival here in Europe at the moment. 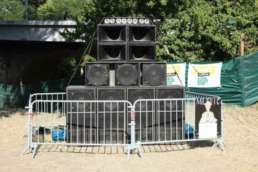 The sound system culture is very alive here in Europe, there are Dub Stations at Summer Jam in Cologne, in two weeks Rototom will too have seven days of it, then Uprising in Slovakia and Outlook Festival in Croatia. These two festivals I attended last year will also have Mungo’s Hi Fi Sound System providing dub stations and sound clashes.